SHERIDAN — The record-setting Sheridan College women’s soccer season came to a close Saturday. 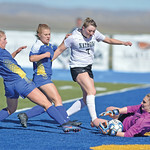 The Lady Generals fell two goals short of even more history as the Laramie County Community College Golden Eagles took a 2-0 victory over SC in the Region IX championship. The No. 2-ranked Golden Eagles have been the road block for Sheridan since Mallery Marshall took over the Lady Generals program last year. LCCC is the only Region IX team Sheridan has yet to beat, and the Golden Eagles were the only conference team to beat Sheridan this fall. LCCC beat Sheridan 2-0 and 3-0 during the regular season, by far the Golden Eagles’ closest conference matches of the year. 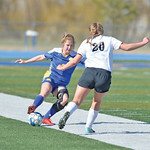 The Lady Generals played their Cheyenne foe close for long stretches in every match, including Saturday’s championship. Sheridan and LCCC were caught in a scoreless tie at halftime. But nobody had held LCCC scoreless this season. In fact, only one team held the Golden Eagles under two goals this season — a 2-1 loss at top-ranked Tyler (Texas) Junior College, LCCC’s only loss on the year. It only took four minutes of play in the second half for Laramie County to break the tie. A defensive lapse from Sheridan allowed Nikita Woods the middle of the field, and she found Annie Rolf for the goal. Just six minutes later, Abby Morillon found the ball off a free kick to make it a 2-0 game. Sheridan stopped the bleeding at two, but the Lady Generals couldn’t break down the steady LCCC possession and never got a clean look at the net. 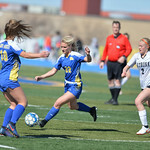 The Lady Generals finished the season 7-4-1, their best in program history. They had never won a tournament game until this season, winning two before falling to LCCC in the championship. 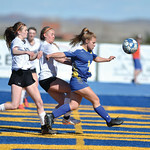 Freshman Hannah Ozmon finished the season with 10 goals to lead the Lady Generals. Sophomore Sidney Burrell finished with eight and four assists. Sarah Jones led the team with seven assists.